RIKUZENTAKATA, Iwate -- A single giant cedar tree around 800 years old that remained standing after the March 2011 tsunami washed away the local shrine and everything else in the vicinity will be chopped down after experts determined that it has necrotized. The giant cedar tree at Imaizumi Tenmangu Shrine was considered a sacred tree, with a trunk circumference of 2.7 meters and measuring about 30 meters tall. Due to the dangers of having such a large necrotized tree on its grounds, however, the shrine has decided to cut down the tree -- a decision parishioners have accepted. Imaizumi Tenmangu stood along the Kesen River in the Kesen district of Rikuzentakata. It was established for the re-enshrinement of Heian-era poet and scholar Sugawara no Michizane, who is also enshrined at Kitano Tenmangu Shrine in Kyoto, and is said to have been built in 1481 by Ota Dokan, known for building Edo Castle. Local residents were fond of the tree, calling it "the giant cedar of the gods." The tree is also linked to Chiba Shusaku, who founded the Hokushin ittoryu style of martial arts at the end of the Edo Period. "It is said that at the foot of the giant cedar tree was the house in which Chiba -- who lived in the town of Kesen until age 5 -- was born in," said Masaki Araki, 72, the shrine's head priest. The shrine, which was at an elevation of approximately 10 meters above sea level, was washed away with the rest of the surrounding landscape by the massive tsunami following the Great East Japan Earthquake. Self-Defense Force helicopters that took part in rescue efforts shortly after the disaster are said to have used the one giant tree left standing as a landmark. The giant cedar, however, had been drenched in saltwater. Major landscapers from Tokyo and elsewhere worked to revive the tree; the following year, several new buds appeared. By 2013, however, the tree began shedding large branches, and in 2015, experts told the shrine priest that the tree had necrotized. "We really wanted to save the tree somehow," Araki said with disappointment, "but we can't risk keeping the tree when it might fall over and block the road used by cars involved in the reconstruction effort, or when falling branches might hurt visitors." 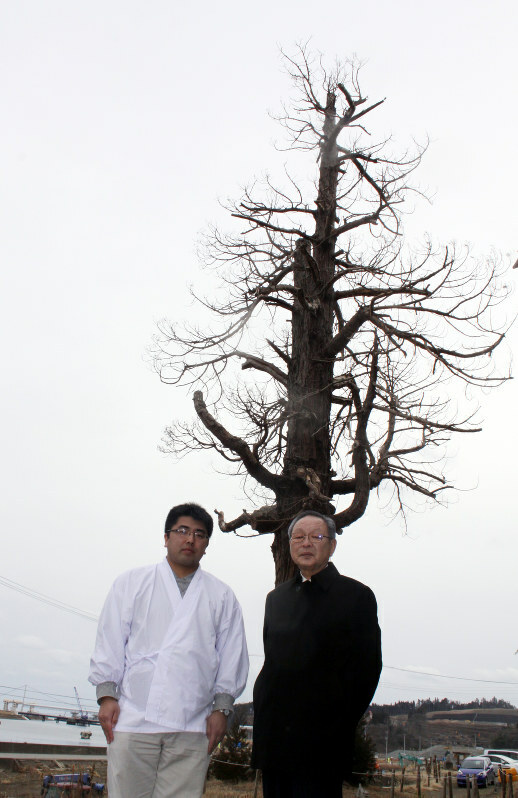 Araki is set to apply for approval to cut down the tree from the Association of Shinto Shrines, a religious entity overseeing all Shinto shrines. Shrine parishioners, meanwhile, are working toward rebuilding the shrine. Volunteers are collecting donations in Tokyo to fund such efforts as well. It has been suggested that parts of the tree, after it is cut down, be used in the main pillar of the new shrine.